RESIDENTIAL WINDOW FILM ENERGY SAVINGS ADD UP! You see them all the time on cars and trucks. Now tinted windows are showing up on people's homes. "Energy savings it can be as much as a 30 percent energy savings in your home, we've gone into homes and cut a temperature by 15 degrees by installing window film," said Kristy Kerwood of KAR Pro Tint Shop in Weston. Kerwood said her company stays busy with this trend of putting window tinting in homes. From light defusing films to frosted glass, Kerwood said window tinting adds a level of privacy among other benefits. 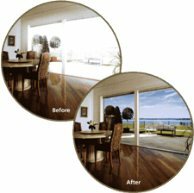 "99 percent UV protection can keep your furniture from fading, your carpet from fading, hardwood floors, and plus gives you the privacy of people seeing through your windows," Kerwood said. Kerwood said a good window tinting job would be something that you wouldn't notice being there in the first place. She said when doing homes the tint is custom fitted and takes about 10 minutes per window. Kerwood's business has worked on small projects like small outdoor sun porches to large projects like restaurants and hopsitals. Customers said whether you own a car or truck or a large home that needs the glare taken out, the cost savings in the end is what matters the most. "It makes your vehicle look a lot better, a lot cooler in the summertime like we are now, not to mention it's really affordable," said Matt Jenkins, of Jenkins Ford. "It's made quite a bit of difference as far as the electric bill and stuff goes it's definitely worth it. If I build a new house, the first thing I'm going to do is tint all the windows," said Shane Hitt of Buckhannon. The shop is located on 137 Armory Road in Weston. Call 304-997-1435 for more information.